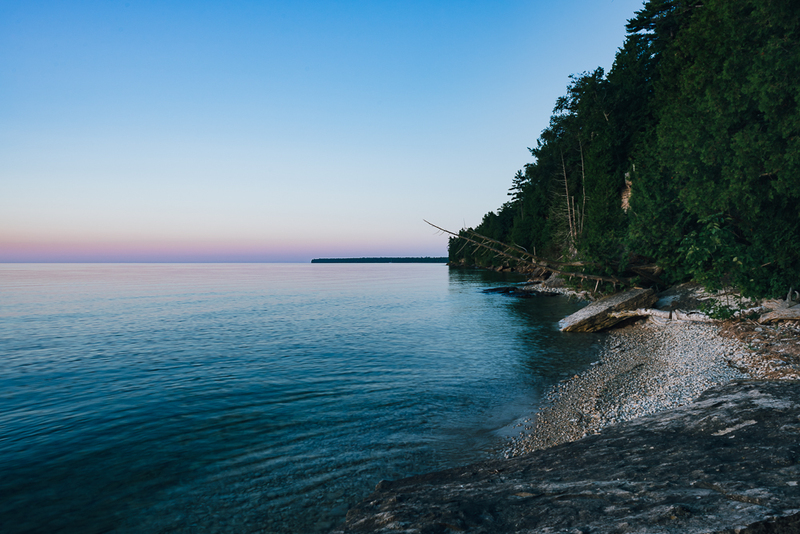 My family and I made our first trip up north to Door County, Wisconsin, this past July, and since we’re headed back tomorrow to spend the first weekend of October up there, I thought I’d get a post up about the previous trip. I’d wanted to go here for years, and with our daughter only 7 months old, we weren’t ready to fly anywhere yet. We spent a week in a cabin in the town of Jacksonport, about halfway up the peninsula on the Lake Michigan side. I’d only seen a handful of photos of the area before driving up, and we were really amazed at the solitude and beauty of this quiet little spot. This cabin along Lake Michigan was built in 1934 and has been kept in great shape over the years. It was pretty rustic, and we loved the cool breeze off the lake with the windows open at night. The view of the lake from some small bluffs just outside the cabin. I spent a lot of time out here at night shooting night photos. I’m still going through many of the night shots I took, but I was so excited to see stars for a change considering we really don’t see any in Chicago. I was up at 4:45am our first morning here to see the sunrise. Absolute and perfect solitude, which I don’t get nearly enough of. Totally quiet outside, the water was still except for a group of geese making their way north about 100 yards from me. The sunrise itself was around 5:28am, the sky constantly changing color and shape in a wash of orange and blue. We had our own lakefront area to ourselves with nobody else around the entire week. At best we could hear kids playing on the town park’s beach about a mile north of us. It was absolutely perfect here. One of the trails we hiked at Peninsula State Park, on the northwest side of Door County. A view of Green Bay from Fish Creek. Much more wind on this side of the peninsula; it was constantly calm on the Lake Michigan side. Had a couple good meals with streak from a local farm, bought at Bley’s Grocery in Jacksonport. My daughter Hannah and I. She had a wonderful time with us! View of Lake Michigan from the Cana Island Lighthouse. One of the few sunsets we got to see, over Kangaroo Lake. The moon grew bigger as the week went on, but I had a couple nights with limited clouds and great views of the stars and the Milky Way. Cave Point County Park is a really scenic place, with limestone bluffs along the lake and colorful swimming holes beside them. This place made for some really nice photos as the sun went down. We will definitely be returning here each summer. It’s a great getaway within five hours of Chicago where you feel even further away from the city.